Festina has now had a complete refit after her Atlantic circuit and is now very smart and in better condition than ever. Festina Lente is fully coded and available to Charter. Day, weekend or event charter. Other Sigma's available for group/large event charters. Because as a privately owned and run vessel she is in superb condition with a very experienced and safe skipper - and if necessary, crew. Check out her racing and cruising record on the main website. 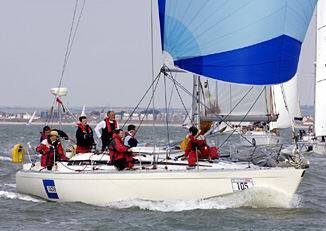 Individuals, families or full crews (racing or cruising) who are looking to gain confidence and experience, or just a good day out, in the Channel or the Solent. We can take up to 8 in the Solent, 7 offshore, or when racing .We can also cater for larger corporate groups who are looking for an adventurous day out in several boats. Racing can be arranged between the boats. We have a superb record of delivering results in Corporate regattas. Folk looking for a boozy day on the water - Festina is a dry ship!